Tropicaâ€™s plant food ranges have always led the way in a market now saturated with a vast choice of products, says Nathan Hill. I think it no exaggeration to say that some other brands want nothing more than to be Tropica products. There’s flattery in being copied. 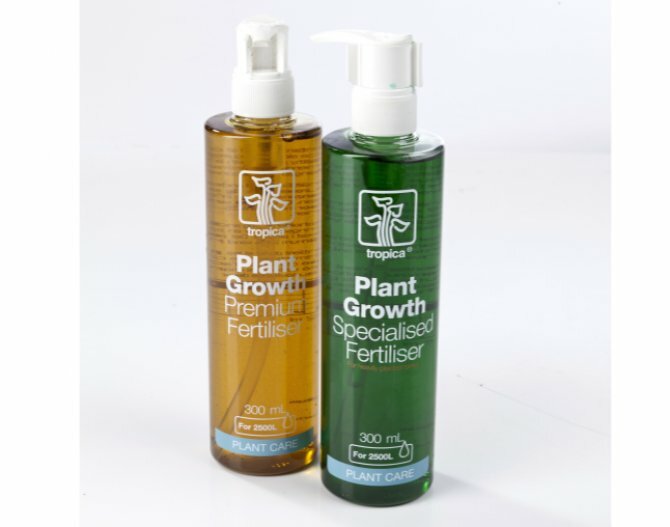 Premium Fertiliser is intended for weekly use, with an easy enough system of dosing using a 'pumps per volume' method, so no messy measuring cups or syringes are needed. Ten pumps a week are required for a 100 l/22 gal tank. The product is nitrate and phosphate free, using the now common wisdom that these two nutrients are produced by fish in the aquarium, and adding them separately can be achieved if needed anyway. If you do want nitrate and phosphate, then you can opt for the Specialised Fertiliser, which is much the same thing with these added extra ingredients. The dosage rate is the same and based on the 'pumps per litre' ratio, so it’s clean to use. Users report that foreground plants like Hemianthus and Glossostigma do exceedingly well on this food, compared to others, but my own tanks are too often that much of a medley of different plant foods that it’s hard to comment with any degree of certainty. Because of those two extra ingredients more caution is needed with this latter product, and Tropica itself concedes that if used incorrectly then algae can exploit the situation. However, there’s nothing that a couple of water changes and a redress of the dosage rate can’t sort out. This has always been and always will be one of the benchmark plant foods on the market — and one that many competitors will struggle to even match, let alone beat.